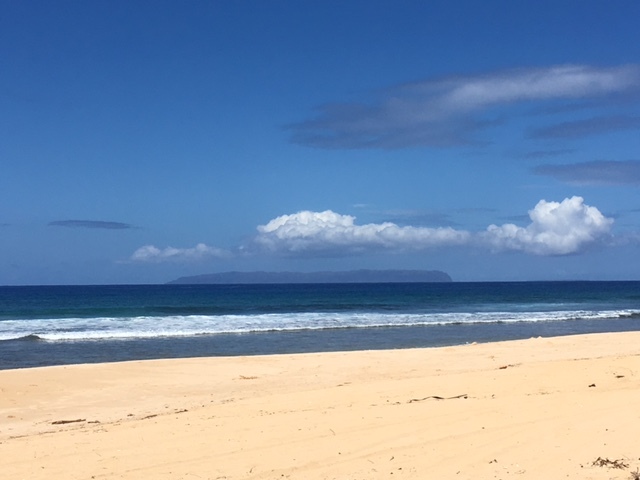 Looking out to the island of Niihau (the “forbidden island”) from the beach at Barking Sands PMRF. Nothing but blue skies. 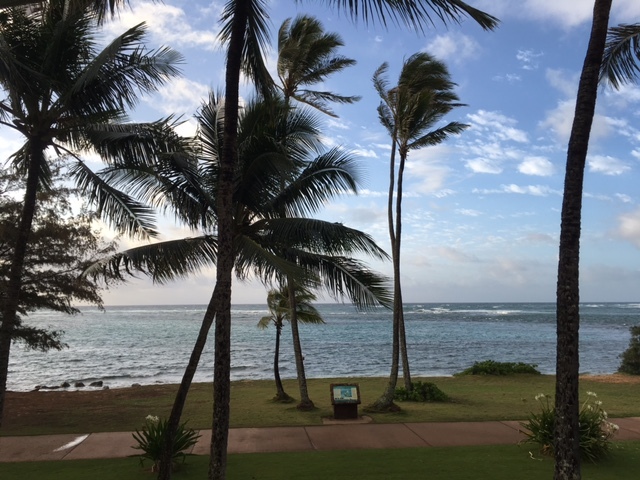 Brett and I drove down to the far west side of the island last Thursday morning to the Barking Sands PMRF (Pacific Missile Range Facility) so I could get my military dependent ID renewed. It rained the entire way drive there until the last mile or two when suddenly it was gorgeous! 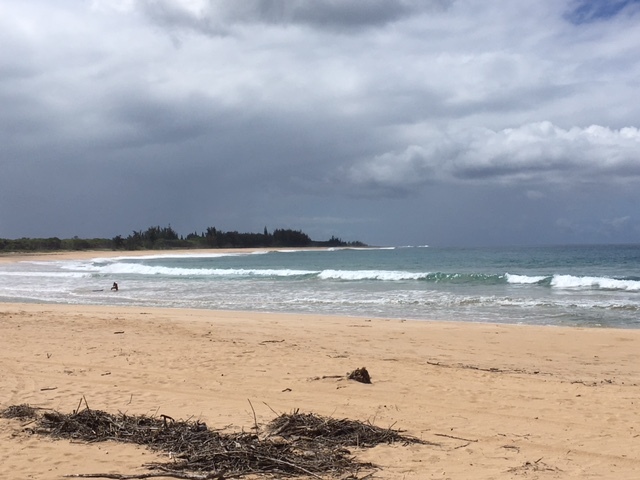 After I finished getting my card, we drove to the beach area on the base to look out at Niihau. The base has fully-furnished beach cottages that we are eligible to rent, and there’s a very good restaurant on the base, so Brett and I think that’s where we may try to go next year for our anniversary/birthday getaway, if we can get a reservation. Being back on base is always a very nostalgic experience for both of us – it was our life for so many years. Looking to the east from the same spot on the beach, and the storm we passed through on the way down and back. It rained all the back until to Lihue. YaYu got a call on Friday informing her that the essay she had submitted to the island newspaper’s Everyday Heroes contest had been selected as the winning entry! When I asked who she had written about she told me I’d just have to read her essay in the paper – hmmm. She will meet with staff from the paper this week for photos and to pick up a $100 dollar prize! Reading: I finished My Year of Meats on Thursday, and I’m now waiting to read Faceless Killers, by Henning Mankell. I was ready for another mystery/procedural, and greatly enjoy the Scandanavian genre, so decided to start in on Mankell’s Wallender series (Faceless Killers is the first in the series). Once again though the library is taking its time releasing the download. In the meantime I’m catching up on some magazine reading. Listening to: Loads of songbirds are out and about this morning – they’re actually quite loud. I can also hear lawnmowers, etc. in the distance, and kids are out playing in the street. Surprisingly, I haven’t heard a single chicken or rooster. Inside it’s quiet – YaYu is studying, and Brett is out on his daily walk/hike/run. The washing machine will be doing its thing though in a few minutes. Watching: Brett and I enjoyed the documentary, Five Came Back, but then started right in on Escape to the Country, or as I call it, “English Country Househunters.” It’s a fun show to watch, but other than a couple of them none of the houses have really appealed to me. I guess English Country style is just not my thing, but I like seeing what interests people and why they choose the house they do, and reject the others. The countryside is gorgeous though, and really the star of the show. Last night we watched Jackie. I had watched some on the plane on the way home from Japan, but fell asleep before I finished so wanted to see the whole thing. Both Brett and I thought it was very good. Cooking/baking: As seems to be our habit these days, everyone fixed their own breakfast this morning: oatmeal and berries for Brett, leftover pad thai for YaYu, and yogurt and berries for me. The farmer that sells sprouts at the market did not have any mung bean sprouts this last week so the menu plan got switched around a bit. We had the Chinese three-color salad on Thursday, and after a return to Big Save yesterday for sprouts we are having egg drop soup and egg foo yung for dinner tonight (eggs on Sunday!). We are just about out of all the treats we brought home from Japan for YaYu’s lunches, so I’m going to bake a pan of brownies this afternoon. Just one more month of school lunches to go before we get a break! Happy I accomplished last week: I almost cannot believe that I was able to get out and do the food shopping, let alone do anything last week because I felt so miserable, especially on Wednesday and Thursday. But, we needed food, and I had to be up early and out on Thursday to get my ID card renewed (because the old one would have expired today), so we stopped at Costco on the way home from that trip and I did OK. Except for Wednesday and Thursday, I still got in all of my bike rides, drank all my water and studied Portuguese. It’s been a rough week though, and yesterday’s bike rides about did me in as the cold had moved down into my lungs. Looking forward to next week: Afterschool sports practices are over! YaYu has segued from one sport right into another from the beginning the year with no breaks, but will be coming home right after school from now until the end of the school year and we can hopefully enjoy a more normal daily schedule. It also means less laundry as there won’t be all the running shorts, t-shirts, swimsuits, towels, etc. that have been added all year. She’s also finished her Chinese tutoring, which means our weekends will be free once more. YaYu’s AP exams begin this week, and she takes the SAT exam on Saturday. I’m not sure she’s looking forward to this, but I’m glad to be getting them out of the way. She’s currently spending most of her time at home in her room studying, only coming out to go to school or eat dinner. Reporting gains and losses: I lost four more pounds this month, bringing my total weight loss so far to 18 pounds. When I lose another five or so pounds I plan to replace my afternoon bike ride with a walk with Brett (after getting a good pair of walking shoes). We put $682.63 into our travel savings account this month toward this year’s goal of $7000. The total amount we’ve saved so far is $2484.34 so we’re right where we need to be. Thinking of good things that happened: Learning that YaYu won the essay contest was the highlight of the week! Also, I guess it’s a good thing that all I caught was a head cold versus something more serious. Colds are miserable, but they have a regular progression and I’m almost done with this one. We stayed within our food budget, although it was tight this month, even after cutting back – we had run out of a lot of things. We put $19.29 in the change/$1 bill jar. Grateful for: I am very thankful that as of tomorrow I am officially on Medicare! Between it and our military health insurance we should see no or very small co-pays from here on out, which is a very good thing, especially since a whole bunch of medical billing finally showed up this past week (like from last year’s physical therapy) – ugh. Brett has been on Medicare for two years now and it’s worked very well – I don’t think we’ve had to pay anything out-of-pocket for him since he enrolled. We really don’t get sick very often, or use our insurance much, but I feel very blessed to have the insurance we do. Bonus question: What is something that you currently want that you really don’t need? For me, that would be an iPad. Between my MacBook Air, iPhone and Kindle, I have everything I need right now, technology-wise, but I’ve been thinking a tablet would be nice. I’m honestly not sure though why I need an iPad at this stage of my life (although I can think of several instances in the past where it would have been great to have one). I’m not a gamer, I don’t watch TV shows or movies other than on TV, etc. But, I still would like one. I’d love to hear from those of you who have an iPad or tablet about how you use it and what it does better than other technology you own. That’s a wrap for this week from Casa Aloha! How was your week? What did you accomplish? What good things happened for you? We realized last weekend that the shorts Brett was wearing were purchased in 1999! I bought them from the Gap, along with three other pairs, on sale for $6 each. Other than being a bit faded they’re still in excellent shape. 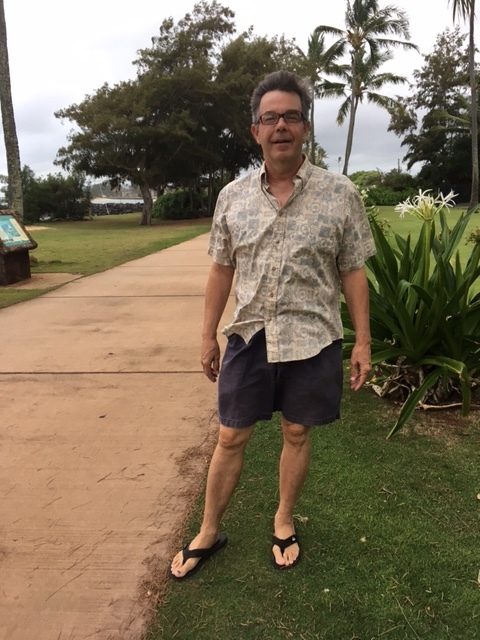 His Reyn Spooner aloha shirt was purchased from Goodwill for just $6.99. We of course brought home the complementary toiletries that were in our room at the Hotel Coral Reef. The soap and shower gel are being used now, but the shampoo, conditioner and lotion were set aside for future travels. We always combine trips whenever possible to save gas, so made a loop of Walmart, Big Save, Cost-U-Less and finished up at the farmers’ market on Wednesday, and then on Thursday morning stopped at Costco on the way home from my appointment at the Barking Sands PMRF base (on the far west side) to get my military ID card renewed. Before we shopped at Costco, we went carefully over our list one more time and were able to remove four items that we either didn’t really need, or that can wait until next month. Rather than buy pre-cut pineapple for kabobs next week ($12.99), we again bought a whole one for just $2.99. The pineapples sold at Costco are from Maui and they’re huge – we’ll get twice as much fruit as a package of pre-cut. We’ll also plant the top and keep our fingers crossed – the chickens have dug up the last two. What frugal things did you do this week? 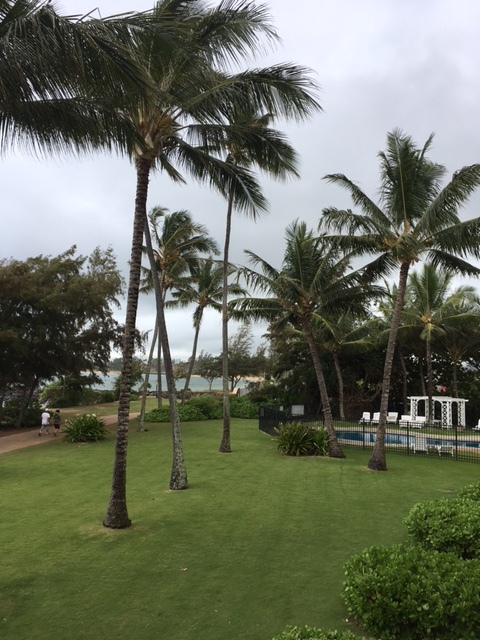 The makai (ocean) side of the Coral Reef Inn (yes, the storm clouds were gathering). Our room was on the second floor, second from the right. 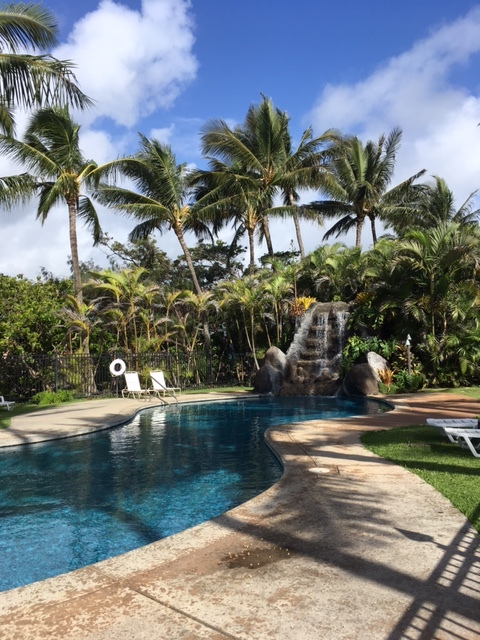 Brett and I have driven by the Hotel Coral Reef in Kapaa more times than I can count; it’s just down the highway from where we turn off to go up to our house and we pass it every week on our way to the farmers’ market. Although it’s somewhat unassuming from the mauka (mountain/highway) side, we’ve strolled past it on beach path walks, and been intrigued by the building and the beautiful landscaping. 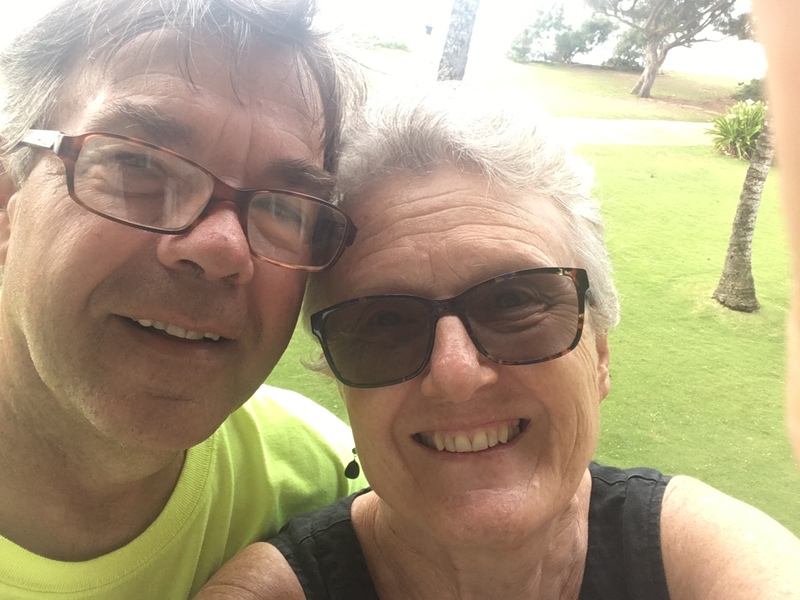 So, when we wanted to take an overnight getaway to celebrate our 38th anniversary (March), and both our birthdays (April &May), we thought of the Hotel Coral Reef. Our room at the Hotel Coral Reef – the room and furnishings were lovely. The strip around the top of the room is actually a soft light that for some reason shows bright orange in the photo. We did look at other resorts on the island for our getaway, but most were w-a-y over what we wanted to pay for a one-night stay. 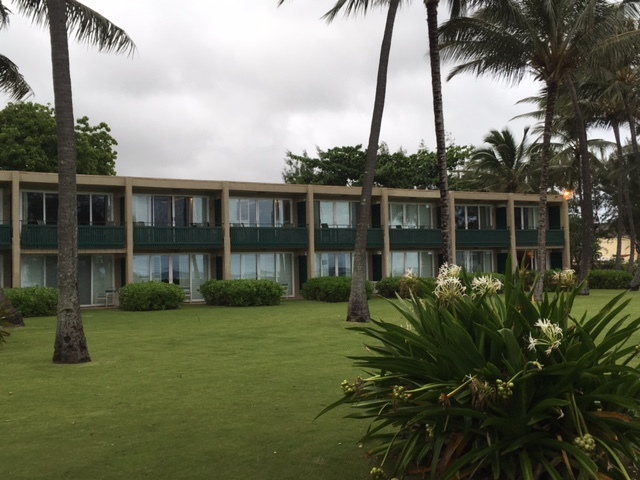 Rooms in Poipu in the south or Princeville on the north side ranged from $300 to over $600 for one night. They all had superb amenities and ambience, but the splurge just wasn’t worth it to us. The view from our balcony looking south. The lagoon pool and waterfall – it was too stormy and windy during our stay to use the pool, but it was looking inviting by the time we had to check out. 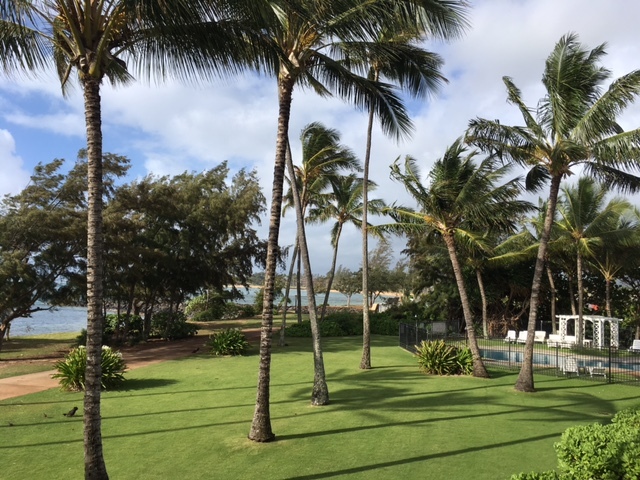 The Hotel Coral Reef has been called one of Kauai’s hidden gems, and has received awards from TripAdvisor as one of the best places to stay on Kaua’i. It’s regularly given 4.5 stars by TripAdvisor readers, as well as on Expedia, Hotel.com and other travel sites. 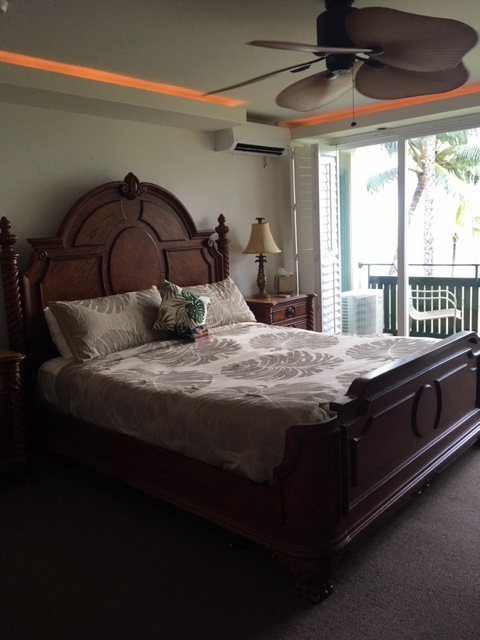 This year it received a “Best Kaua’i Hotel” award from Honolulu Magazine. The hotel has had an interesting history: It was first opening by the Matsumura family (date unknown) on the same land that housed the first fire station in Kapaa. In 1962 the sixteen-room masonry building was constructed, and it’s survived two major hurricanes. The Matsumura family sold the hotel in 1985 to new owners, and in 2001 it was sold again to Pixar Development. Pixar undertook extensive renovations, including the lush landscaping around the hotel and the lagoon pool and waterfall. The hotel got new owners about a year and half ago, and more renovations are planned in the near future including a third story addition to the masonry building which will include two suites and a plantation-style roof, and updates for all guest rooms. The view while we had our coffee and breakfast on the balcony in the morning. 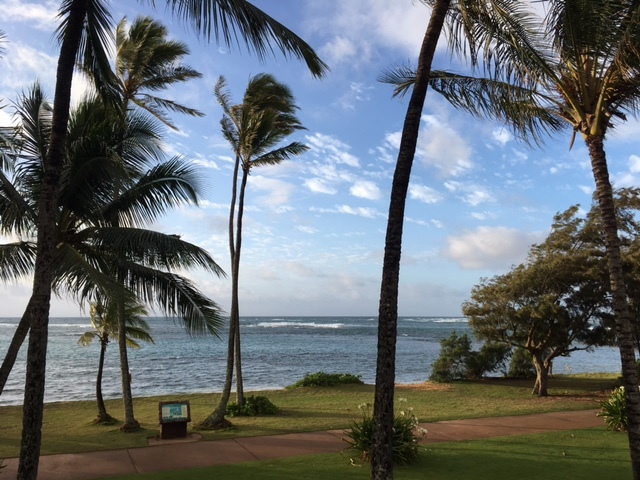 Brett and I booked a deluxe oceanfront room for our getaway, and the views did not disappoint. My only complaint about the room was the mattress was too soft for me, but otherwise every amenity you could think of was provided, including a free continental breakfast, free bikes to ride around town or on the beach path, a large movie selection, and books. You can also get an oceanside massage during your stay at the hotel, although it’s provided by an outside contractor so not free. Our dinner at Sam’s Ocean View was yummy. The view was complimentary with dinner. 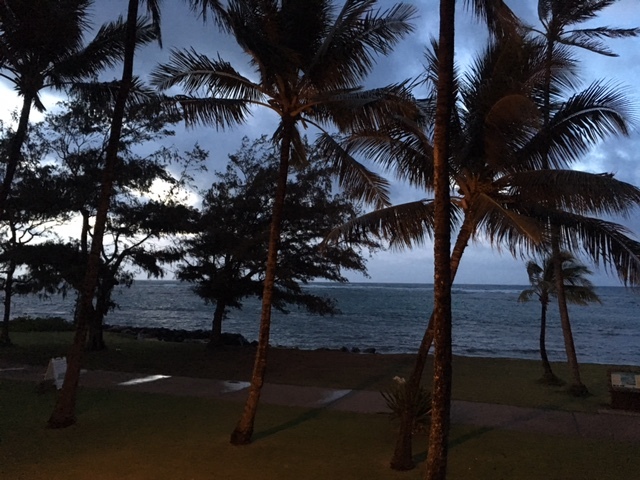 It was a short walk from the hotel to our dinner spot, Sam’s Ocean View restaurant. 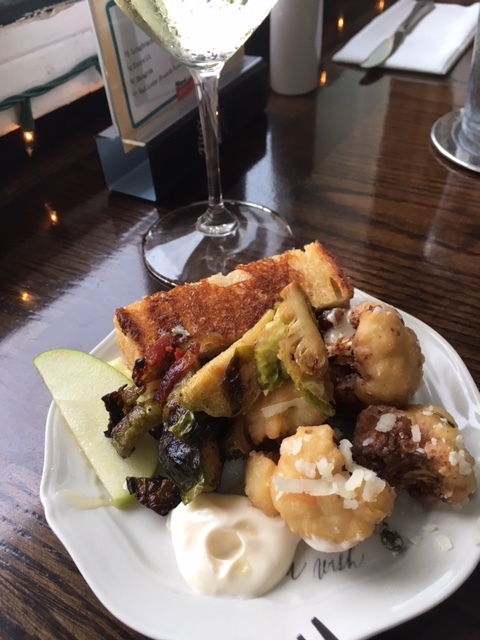 We had decided ahead of time to keep both expenses and calories down by ordering two small plates (crispy tempura-battered cauliflower and roasted brussels sprouts with sun-dried tomatoes and panchetta), and the grilled cheese sandwich board (brie with apple and fig jam on local sourdough). Everything was so delicious! Brett had thought he might have dessert, but we were both too full before we finished, and ended up bringing the leftovers back to our room (and then home the next day for lunch). You can sort of see it in the picture, but the wind was quite strong and getting stronger while we took our after-dinner walk. 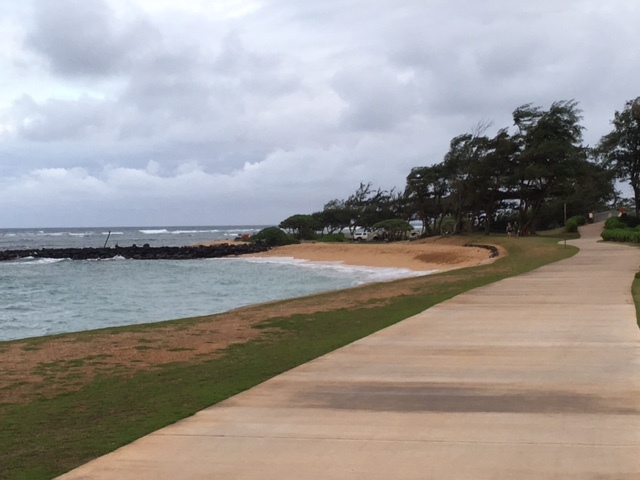 After dinner we took a 30-minute walk south on the beach path, down to Baby Beach and back to the hotel. It had been overcast when we arrived, but as we set out on our walk more clouds were really rolling in and the wind picking up. It was rather gloomy, but we made it to the beach and back to our room before the storm began. 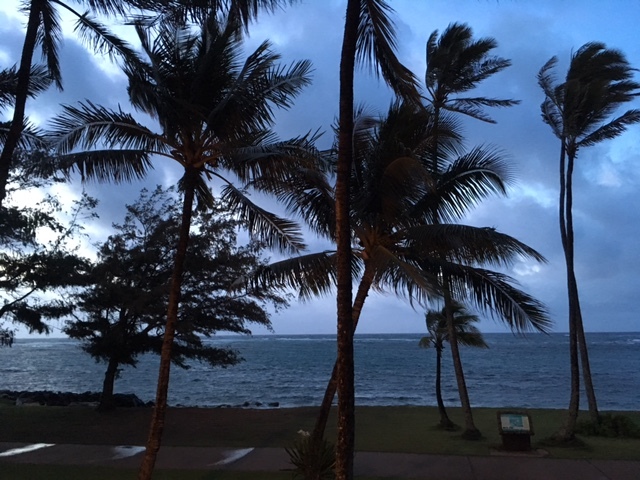 Both Brett and I stayed up to listen to the ocean’s roar, and hear the wind whip through the palm trees – very exciting! The sun trying to break through the clouds at sunrise . . .
About 10 minutes after “official” sunrise it was getting a little brighter. Forty-five minutes after sunrise there was plenty of blue sky, although the wind was still quite strong. One thing we wanted to do while we were there was wake up early on Sunday morning to watch the sunrise. Unfortunately, the previous night’s storm hadn’t disappeared completely, and there were still too many clouds on the horizon to enjoy anything spectacular from our balcony. We did sit outside to enjoy our morning coffee and continental breakfast, and eventually the clouds broke up and the sun and blue sky appeared again. We had wanted to go for a bike ride on the beach path before we checked out, but the wind was still too strong and we had to skip it. We had the sun at our back, and had hoped to take a morning bike ride, but the wind was just too fierce. YaYu asked us a couple of weeks ago why we had decided to stay so close to home for our getaway. “Because someone else is still going to make the bed, and cook the dinner and wash the dishes, that’s why.” And because it was affordable – for less than the cost of the lowest-priced room elsewhere we had a wonderful getaway and celebration, right in our own hometown! 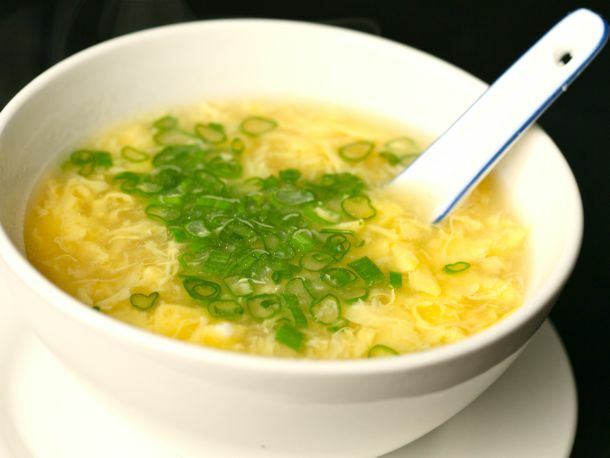 YaYu loves to make (and eat) egg drop soup! Shopping week! Thank goodness too – other than having several protein choices on hand, we are out of almost everything else needed to make a meal. 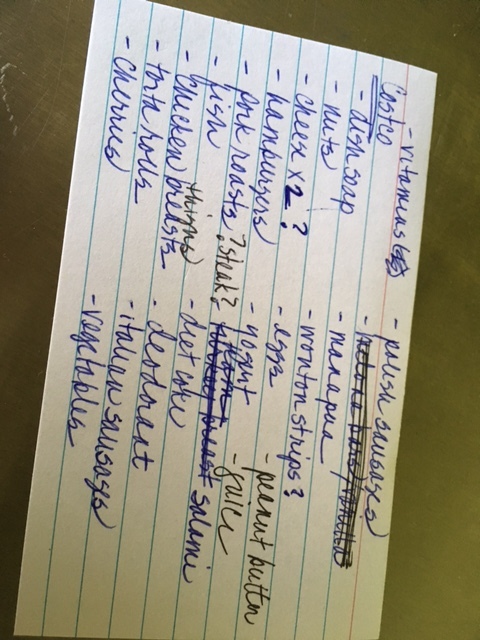 I actually had a little trouble coming up with what to have for dinner tonight because there is no produce left in the house – we finished all of that up over the weekend and yesterday. For some reason we forgot to buy more zucchini at the farmers’ market last week, so tonight it’s just spaghetti with marinara and meatballs, and bread for YaYu and Brett. Does marinara count as a vegetable? 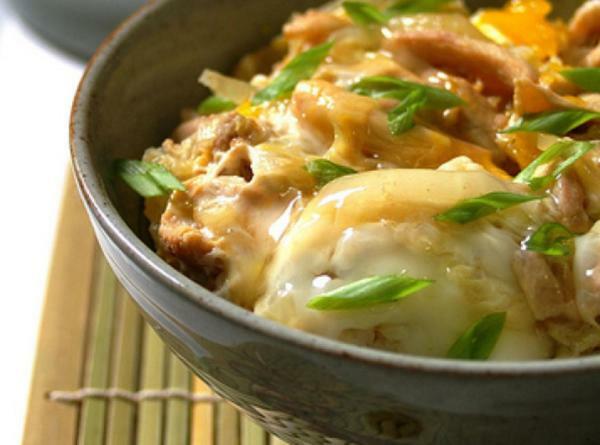 The egg foo yung, pad thai and Chinese three-color salad will use up our monthly Costco roast chicken. I also will be using some of it to make chicken salad for sandwiches, or in my case, to eat with tomatoes. I add diced celery, sliced green onion, and slivered almonds to my chicken salad, and blend with a curry mayonnaise. YaYu likes the almonds left out, and blended with sriracha mayonnaise. To each his own. Besides picking up mung bean sprouts at the farmers’ market, we’ll also need cucumbers, tomatoes, zucchini and a jalapeño pepper, as well as bananas and papayas. Mangoes are showing up at the market now, but they’re still too expensive. We have a bag of frozen mango chunks that I can use to make Friday night’s salsa. WenYu will be home before our next Big Shop, so some of her favorites (i.e. manapua) are on the list this month. If it’s not on the list, we don’t buy it. Fingers are crossed that we come in under budget with our monthly big shop! Brett and I are in the beginning stages of planning for next year’s BIG Mystery Adventure,™ even though our departure date is months away, more than a year really. Right now we’re primarily in saving mode, as well as losing-weight-and-getting-in-shape mode, but we’ve got a basic itinerary in place, and I’ve begun the research process, which of course has me in my happy place. As always, my ultimate goal will be to put a solid foundation in place for our trip without choreographing every minute we’re on the road, all while staying within our budget. Where do we want to go? You might think it’s easy to pick a travel destination, but not always. There are lots of places Brett and I want to visit, in the U.S. and all over the world, and we have our family in Japan that we want to see (fairly) regularly. So, we usually start with a list of places to go, talk about them, both pros and cons, and then whittle down the list until we have a destination. Sometimes we can agree and decide quickly, other times it takes us a while longer. Then, once we know where we want to go, and when, we can start figuring out how much we need to save. We always come up with a Plan B too. How much will it cost to get there (and back)? The next step is to start figuring out how much it will cost us to get to our destination. Even if a trip is more than a year away, I start checking out airfares to get a general idea of what I can expect in the way of prices. I also spend a bit of time reviewing airlines to make sure they have a good reputation for service and safety. Right now there’s just about no amount of savings that would get me to book with United (which I’ve always tried to avoid anyway). If possible, we always try to add an additional amount to our budget to upgrade seats. How much will it cost to stay there? At the same time I’m looking at transportation, I start thinking about lodging. Do we want to stay in a hotel? A B&B? An Airbnb or VRBO rental? Where we’ll stay will depend on how long we’ll be at a particular location, or whether we’ll be moving around. It usually costs much less to stay at a vacation rental than paying for a hotel room every night, but sometimes the hotel amenities and location can make it worth it to pay more. The New Sanno Hotel in Tokyo was more affordable, and in a better location for us than a Tokyo Airbnb, and a stay at the El Tovar Hotel at the Grand Canyon had been on my bucket list for as long as I can remember, so that’s where I booked for our trip there last year. The El Tovar cost more than other lodging there, but was worth every penny for the location and the amenities. I love looking through Airbnb though, imagining what it would be like to stay in the different homes. How much will it cost to eat while we’re there? This is one of the most difficult parts of planning, at least when it comes to figuring out our budget. Will we be able to prepare some meals on our own or will we need to have all of them prepared for us? Are there menus we can check ahead of time? Restaurants and dishes we might want to try while we’re at our destination are included in this part of the planning, and help us eventually come up with a reasonable daily amount for meals. What do we want to do while we’re there? This is an area of the planning where Brett and I work together. We have different interests, but plan together what to do while we’re someplace. Are there unique or special activities at our destination (like our mule ride at the Grand Canyon)? Are there must-see sights or museums? Are there activities we might want to do on our own or will we do everything together? Are there tours we might want to take? Do we need to make plans for our “down time” or does it look like we will head to our lodging every evening and fall right into bed? We read guidebooks, travelogues and blogs, and eventually come up with a list of things we might want to see and do while we’re at our destination (as well as what they might cost, if anything). How will we get around at our destination? All things considered, this part of the planning is fairly easy, but still needs to be figured out for the budget. Will we need a rental car? For how long? The Costco Travel site has car rental prices a fairly long way into the future so that I can get an idea of how much we will need to set aside for that expense. 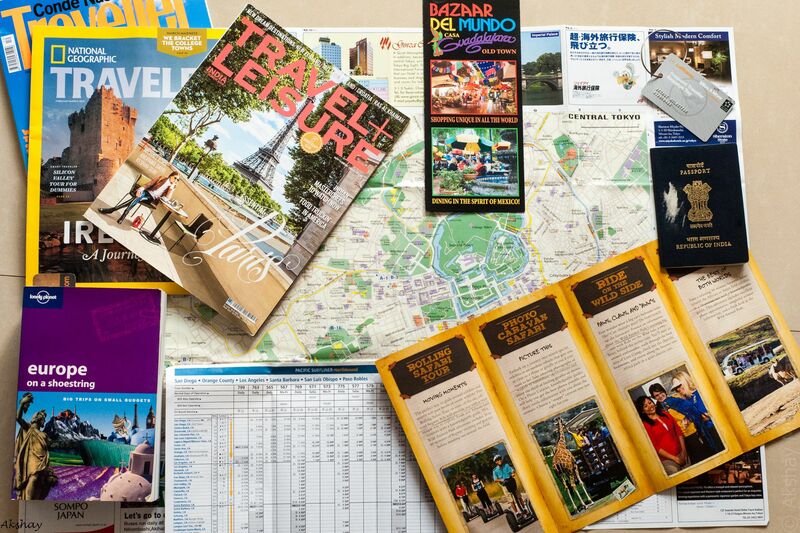 For some places, Japan for example, we have to get ourselves from the airport to our lodging by train or bus, but will otherwise be walking or using public transportation, and those expenses need to be considered as well. There are loads of sites now where you can find out exactly how much public transportation will cost, no matter where you’re going (or if there even is any public transportation). Stay flexible, and adjust plans as necessary. Our first choice isn’t always the best choice, and we don’t have to see or try to do everything. Read and find out as much as I can about our destination. Knowledge is power. Keep looking for ways to save while we’re there. Figure out exactly what we will need. This includes luggage, clothing and shoes, camera, and electronics, as well as whether or not we’ll need travel insurance, how we’ll access funds while we’re on the road, and how we’ll communicate with other family members. Planning travel can be exciting, but also can feel overwhelming at times. I know though that eventually everything falls into place, and a good foundation, along with knowledge about our destination and a sense of adventure, means we’re going to have a terrific trip! It was overcast when we arrived, but still lovely – this is one of the views from our balcony. Brett and I enjoyed a wonderful, romantic getaway yesterday, at a little hotel right down the hill from our house. The hotel was lovely, dinner was fabulous, and the views were sublime. More details will be coming up later this week! This past week we had to once again deal with someone who knows nothing about adoption and what it means. We submitted the paperwork for YaYu’s China visa earlier in the week – it was easy, but in YaYu’s case, because she was a Chinese citizen until age five she has to put her former Chinese name on the form and submit the Chinese passport she was given for immigration to the U.S. (YaYu immediately became a U.S. citizen when we arrived back on U.S. soil). Again, no problem – we’ve had to do this each time we’ve applied for a Chinese visa for the girls. The Chinese passport clearly states her birth date as does her U.S. passport. Two days after we sent off the application, Brett got a call from the travel agent who is handling the visas: “We need copies of your and your wife’s passports. And a copy of your daughter’s birth certificate. China has a new policy this year.” Um, no they don’t – we have read all the regulations, especially for minors – the birth certificate and parents’ passports are required for children 16 and younger, but YaYu is 17. But, we scanned them and sent them off. Brett said after he hung up that the next thing would be the agent calling and asking for YaYu’s adoption paperwork, and sure enough, a couple of hours later we got another call from the agent telling us that we needed to submit all of YaYu’s adoption paperwork. I took the phone and informed the agent that no, we did NOT have to submit that paperwork, that our three adopted daughters have gone to China on more than five occasions and we have never needed to submit adoption paperwork. “Oh, it’s a new regulation.” No, it’s not – you just don’t get adoption. YaYu got a Chinese visa two years ago – check her passport – and she did not have to submit adoption paperwork. China knows all about adoption. “Oh. I see, she did already get a visa. Sorry.” I wanted to reach through the phone and grab this woman by the throat and tell her that’s what adoption is all about – it’s done. We don’t have to “prove” to anyone anymore that YaYu is our daughter. YaYu has a valid U.S. passport, the same last name as us, etc. – that’s all you need to know. We had to go through something similar back in Portland, when we applied to renew Meiling’s and WenYu’s passports. According to the clerk that handled their applications, their previous U.S. passports were apparently not proof of their citizenship like they are for everyone else; we had to re-submit their certificates of citizenship. If they had been white and adopted (or not), no problem, no questions asked. Asian and adopted? Please prove again that they’re really citizens. Grrrrrr. On a more upbeat note, my clothes have been feeling much looser lately, so this last week I tried on several pairs of the size small pants that I have been holding on to for the past 3+ years and I got most of them on, more easily than I imagined in some cases. They’re still tight, but the fact that I could pull them up and button them is a BIG deal and I’m more motivated than ever be able to wear them again. Reading: I’m still reading My Year of Meats. Such a good book – I’m glad I decided to reread it. I’ve been reading while I ride my bike every day all this past week – why I didn’t think of this earlier I don’t know. Listening to: The wind was howling this morning down at the beach, the remnant of a big storm that passed over us last night, but there’s only a light breeze up here at our house, and it’s very quiet. There are still baby chicks peeping out in the yard, songbirds are singing, and the washing machine is already going. Watching: Brett and I finished Season 1 of This is Us last week, and are already excited about next season. We’re going to start a three-part documentary on Netflix tonight: Five Came Back, about the movie makers and producers, including John Huston, Frank Capra and William Wilder, who filmed World War II, often at great danger to themselves. Up on deck after that is Escape To the Country, about country homes in England. We’ve heard a lot about it and it sounds like something we’ll enjoy. For our Friday night movie we watched Hidden Figures, which was excellent. Cooking/baking: Brett and I had the complementary continental breakfast at our hotel this morning – I had fruit, and Brett enjoyed yogurt, granola, and a pastry. YaYu won’t get home from Oahu until this evening, but Asian week continues with a late dinner of Chinese scrambled eggs and tomatoes. We bought some beautiful tomatoes at the market this past week, so we’re looking forward to it: Chinese comfort food! Happy I accomplished last week: Brett and I finished up the itinerary for next year’s BIG Mystery Adventure™, and I’ve been working on a basic idea of prices, so we’re starting to get an idea of how much we have to save, which is what we’ll be focusing on for the next several months. I earned the second goal on Swagbucks every day this past week which will add at least an additional 150 bucks to add to my bonus total for the month. The last Japan Giveaway prize was sent off on Friday morning. I did all of my daily bike rides (and increased the tension this past week, so it’s a little harder) except for yesterday evening, but Brett and I took a 30 minute walk on the beach path at dusk yesterday. I drank all of my daily glasses of water and then some, and studied Portuguese every day. Looking forward to next week: It’s not especially exciting, but Brett and I will be doing our big monthly Costco shop on Thursday, and will go to Big Save on Wednesday. We usually do the shop on a Wednesday, but Costco’s sale prices begin on Thursday this month so we swapped the days. I’m going to take another small loaf of the raisin bread we brought home from Japan out of the freezer later today, and will have a toasted slice with a little butter, along with some fruit, tomorrow morning for breakfast. The bread is so good, and it’s my one carb indulgence. Thinking of good things that happened: YaYu is having a great time at her convention, which makes me happy because she worked so hard to get herself there. She had her last track meet last week, and although she didn’t make the finals (they’ll be held this coming Friday) she had a good solid season, and improved from last year. She also did very well at tennis, especially since it was her first time to ever play the game. We put $8.00 into the change/$1 bill jar. Grateful for: A few months ago Brett took over the chore of washing the evening dishes. I have been feeling very thankful lately that he does this now. The job never took me very long, and yet it was the chore that dragged on me the most. I had no idea that such a little change would make such a big difference to me, but sometimes it really is the little things. 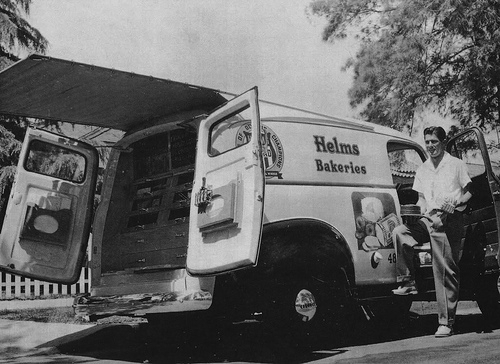 The Helms bakery truck – the big wooden drawers in back were filled with donuts, cookies and fresh-baked breads and rolls. A big glazed or jelly-filled donut was just five cents. Bonus question: What catches your eye at a bakery? It really depends on what time of day I go. I love lemon pie or lemon tarts, so that’s always the first thing I look for if I’m at a bakery in the afternoon. In the morning I prefer something like a scone (cranberry-orange is my favorite) or a fruit-filled danish, or anything not too sweet. One thing I don’t really care for with bakery items is chocolate. Not sure why, because I like chocolate, but it just doesn’t appeal to me as much as something with fruit. I also love a good donut, especially a raspberry jelly-filled one. I’m pretty particular though – I grew up eating the absolute best glazed and jelly-filled donuts ever, from the Helms bakery, whose truck came to our street once a week, and were also parked behind the school one other day. Krispy Kreme doesn’t even come close. Unfortunately, bakeries aren’t really happening for me these days – can’t have the carbs. Sad! That’s a wrap for this week. How was your week? What did you accomplish, and what are you looking forward to? What good things happened for you? 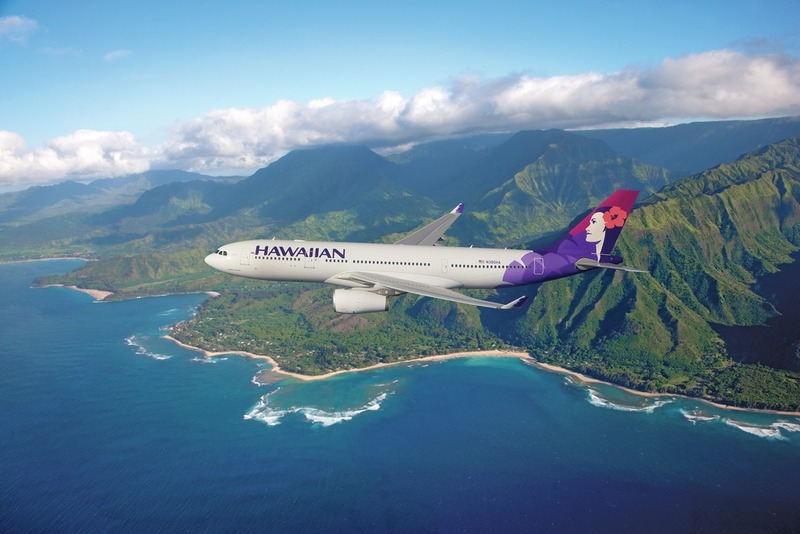 We used some of our Hawaiian Airlines mileage stockpile this last week to book WenYu’s ticket from Honolulu to Kaua’i in May. Total out-of-pocket cost for her flight: $5.60 (the taxes). As usual, we washed only three loads of clothes this week, and hung many of them out in the sun to dry. We wash in cold water, except for the white load when we use the ‘Eco-warm’ setting (our towels are white, so they’re in this load). YaYu needed a long dress for one event at the Key Club convention this weekend, and the dress code is fairly strict. She spent several hours looking online for something both appropriate and affordable, but ended up buying a simple black dress and ‘gold’ necklace at Ross this past weekend for just $10.88! A friend will loan her a pair of shoes to complete her outfit. Brett and I have decided that rather than ordering off the regular dinner menu at the restaurant tomorrow evening, we’ll order three or four small plates instead and share those – less money, fewer calories. 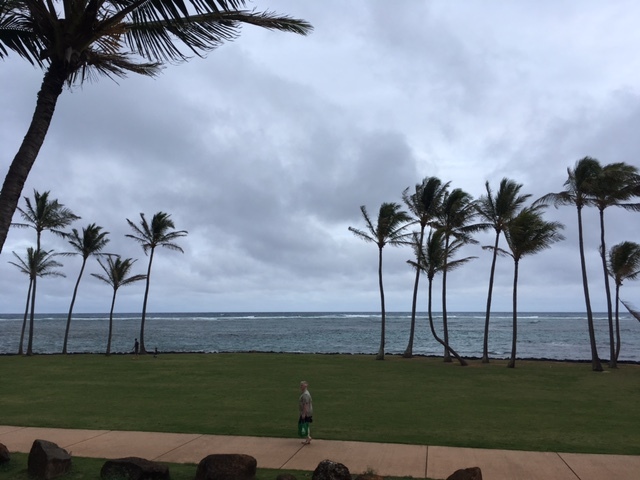 We were very close to having a no-spend week: Other than our trip to the farmers’ market (money already set aside), the only other spending was for the tax on WenYu’s flight, and $8.80 to send YaYu’s Chinese visa application over to Oahu via FedEx. Necessities only! What frugal wins did you have this past week? 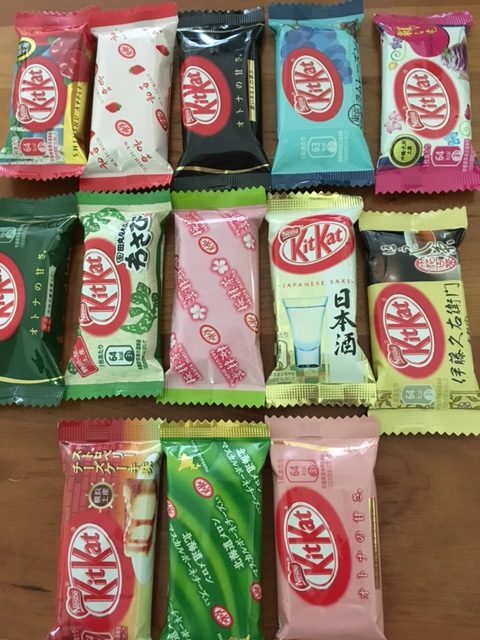 The randomly chosen winner (I used Random.Org) of the Ultimate KitKat Tasting Experience is Vivian – congratulations!! Coincidently, she was also the only one to correctly guess my favorite KitKat flavor: rum raisin (matcha is my second favorite, followed by raspberry). I want to thank everyone once again so much for all the lovely and informative comments I received during the past three weeks, and for so enthusiastically supporting the giveaways. I was amazed by the response to all three Giveaways: there were over 50 entries for the bird cookies, 71 for the kitchen set, and this last one had 84 entries – that’s a lot for my little blog. I have said it before and I’ll say it again; I have the best readers! 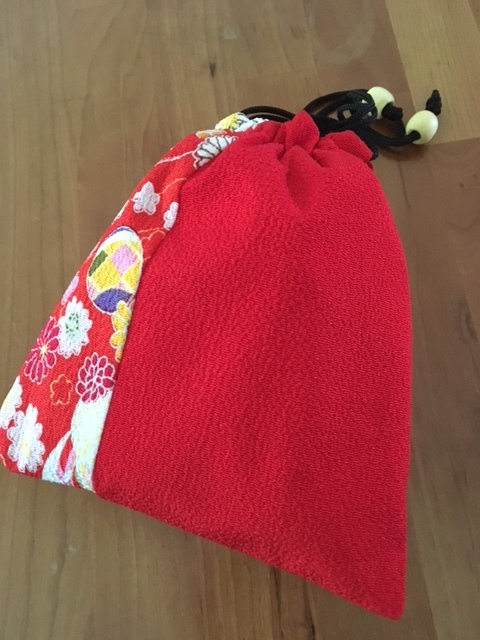 Japan Giveaway #3: Last Day To Enter! Today’s the final day to get an(other) entry included in the drawing for the Ultimate KitKat Tasting Experience. You can submit your entry at the giveaway post until midnight tonight, HST. The winner will be announced tomorrow morning! Well, a week still has seven days, but this is going to be a shorter week for me, cooking-wise. YaYu has her penultimate track meet of the season on Thursday, and then she leaves on Friday afternoon for the big Key Club leadership convention on Oahu. Our Friday night dinner, meatball subs, is super easy to prepare, and on Saturday evening Brett and I are taking our local anniversary staycation, and will be having dinner out that night (the restaurant is just a short walk from our hotel). So, there won’t be as many meals to prepare. Most meals require stovetop cooking, but if it gets hot again I’ll have YaYu step in and do some of the cooking. We’re also getting close to our monthly Costco big shop next week. We’re in better shape than we usually are at this point in the month with what we have on hand. I’m not quite sure how or why that happened, but I still have a pretty full freezer and pantry to shop from when it comes to meal planning. Every dish on the menu this week, at least when YaYu is home, is Asian – or as I like to call it, Asian-y – which will make her happy. I’ve got Thai, Japanese, and Chinese cuisines represented. Brett asked me the other day though if we could please have less Asian food once YaYu goes off to college! He likes Asian food, all kinds, and all the dishes I’m preparing this week, but said he’d prefer other things (I try, honest!). Hopefully the meatball sub on Friday evening and dinner out on Saturday will help break things up for him. We’ll just need cucumbers, tomatoes and bok choy this week from the farmers’ market. I bought broccoli last week, and may buy more if I see it again, and we’ll also be picking up more papayas and bananas as well.